All Comet mills work on the direct acting principle, by the use of a single-throw crankshaft, and so there are only three working parts. They are the driving shaft which is integral with the wind, wheel and crank, the connecting rod and the crosshead. The swivel and drawbar are not really working parts for the conversion of the rotary motion of the driving shaft into the reciprocating motion for the pump plunger. In a geared mill with two pinions, two spur wheels, extra moving parts and more bearings, it is obvious that the loss of wheel power by friction in its moving parts must be considerably greater than it is in the Comet. Approximately 40% of the power is lost in a geared milt as compared to a 10% loss in a Comet. As a result, the Comet transmits much more of the wheel power to the pump plunger for the job of pumping. In the small Comets, a powerful leverage is obtained by adopting a short crank radius. Extra theoretical leverage may be obtained by the use of gears, but as there are then less upstrikes per minute for a given wheel speed, their strikes are longer but they are also slower. As wind is the source of power which rotates the wheel, the power developed by the wheel depends upon its size and design. Assuming that the wheels (size for size) of a Comet and a geared mill develop the same power, no matter what the gear ratio and stroke length may be, it is absolutely impossible for a mill with gearing to transmit more power to the pump plunger. On the contrary, as explained above it loses more developed wheel power by friction in the moving parts. With the Comet, the weight of the pump plunger and rods is balanced by two balance weights which are clamped on wheel arms in such a way that the weights are moving downwards when the plunger is moving upwards. That is one of several exclusive features in the 8ft, 10ft, 12ft and 14ft sizes of Comet mills. Therefore, it matters not what pump sizes and elevations are specified in the pumping tables for other makes. They cannot possibly be better than those specified in the Comet pumping table. 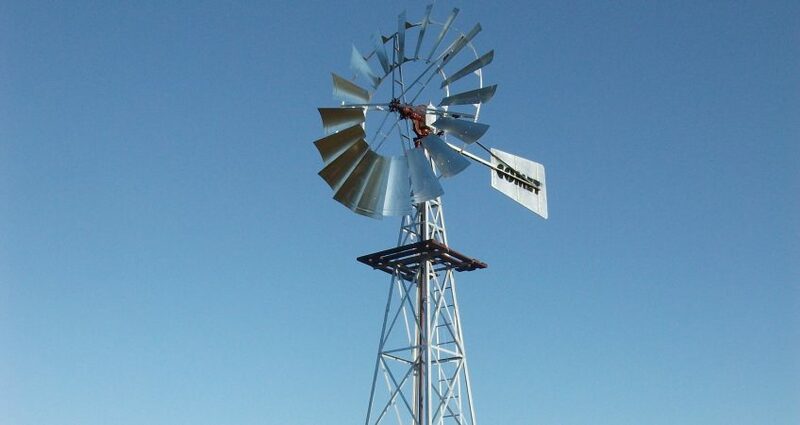 With those two very important features and the fact that the special hardwood bearings’ surfaces attain a high polish thereby reducing starting friction to a minimum, it may be clearly understood why the Comet, when loaded in accordance with our pumping table, properly erected and carefully balanced, will start pumping in lighter winds than other windmills. That is why Comets are “The First to Start and the Last to Stop”. After all, when a person buys a mill he buys the maximum quantity of water he can have pumped over a period of 30 years or more. He wants that water supply to be reliable and not interrupted by serious and costly breakdowns which may occur in a drought or at most inopportune times. It is in these respects that the Comet is by far the most superior and high quality mill, and when it’s slightly higher first cost is distributed over the millions of gallons pumped, the extra cost per thousand gallons is only a very small fraction of a cent.